A leak in an underground line. 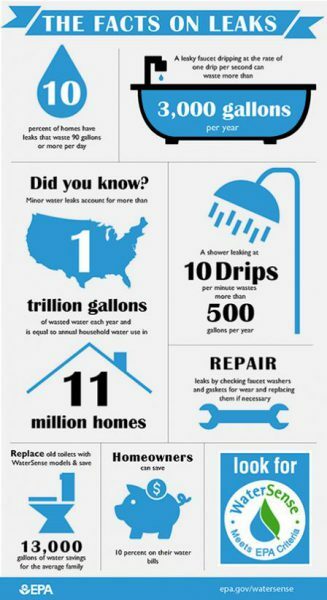 Repairing these problems when noticed will help reduce your water bill. Washing vehicle, sidewalk, decks etc. Even a small leak can have a big cost. WATER COSTS MONEY … DON’T WASTE IT!! Any fixture that uses water can develop a leak. Most often, leaks are within the toilet (the small parts in the tank may need to be repaired or replaced). Other common sources are dripping taps, hot water tanks and pipes (either under the sink, within the walls or under the building). Other leaks, more costly to repair, are located underground between the meter and the building. If you hear water running when you shouldn’t, or your bill appears higher than normal, please have us check for a leak. If you choose to water, do so conservatively. A garden hose, when on for 70 minutes, will use about 100 cubic feet of water. Over a two-month billing period this could lead to a considerably high utility bill and a lot of water usage. Only water when absolutely necessary. When possible, it is best to water after the sun has gone down or where there is shade so the water does not evaporate too quickly. Turn the water off at the tap when not in use, rather than assuming that the hose nozzle has shut the water off completely.